Micron Laser Technology has specialized PCB cavity skiving processes. The cavity wall can be formed by using etched or laser ablated copper openings as a mask or directly on exposed dielectric. Cavities formed with copper etched to the required cavity dimension create straight walls with minimal taper despite aspect ratios greater than 1:1. Depending on the material and its depth, laser direct cavity walls tend to exhibit taper along the wall height. MLT programming techniques can reduce the effective taper to below 10% of the cavity depth. The most cost effective cavities land on unetched areas of a metal layer. 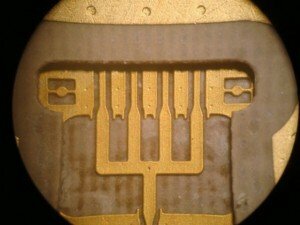 Utilizing appropriate energy delivery of IR wavelengths, the dielectrics absorb the laser energy but the metal reflects the energy to leave a clean surface for plating, wire bonding, or solder reflow. Creating cavities that stop on etch circuit layers is accomplished with MLT control depth cavity skiving. MLT control depth, cavity skiving delivers an even distribution of energy across the cavity area through custom programming techniques and utilizing the right spatial and temporal laser beam profiles. As the laser cavity processes to within 25um – 50um of the desired depth, the ablation switches from higher energy or ‘coarse’ delivery to a multi-pass of lower energy or ‘fine’ delivery. This fine ablation skiving cleans the dielectric from the circuit surface and stops just below the etched circuit plane. In cases where standard plating preparation is insufficient in removing some micron level contaminates that inhibit plating, MLT provides a UV laser pass to the cavity surface to remove carbon contaminates that may be invisible to infra-red wavelengths. The process times or cost of laser produced cavities are based on the total volume of material removal. When cavity depths exceed .008″, mechanical pre-milling the cavity to within 5mils of the target layer prior to laser can greatly reduce the laser cavity skiving costs. 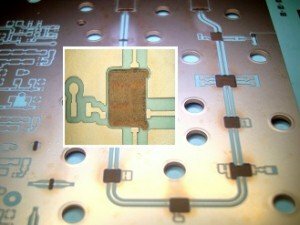 Laser skiving of PCB cavities can have limitations with some material stackups and tolerances. Please contact our sales staff to discuss your PCB cavity requirements.